"Pay attention...something eternally beautiful is going on here". This afternoon I was sitting on the Mall parking lot in my police cruiser taking a lunch break and meditating on a book entitled, “Radical”, wishing someone would have warned me beforehand about the dangers of reading a work like this. David Platt’s writing drives a stake right through the heart of the cultural Christianity that America has created to satisfy their comforts and soothe their convictions. It is a wonderfully dangerous book. From first few pages, I bonded with the author’s passion and heartache of how we have been lulled to spiritual sleep by the “good life” of the American dream while leaving behind the mission of our Master, devaluing the cost of our salvation, and losing the wild, untamed risk of our faith. “I could not help but think that somewhere along the way we had missed what is radical about our faith and replaced it with what is comfortable.” He writes. Feeling a bit guilty, I stopped reading for a just a moment and glanced above my book for personal reflection, while simultaneously scanning the Mall parking lot for impending trouble like a faithful sheep dog. About 30 yards to my right I noticed a middle-aged man exit a silver minivan and then walk to the rear and lift the trunk lid. He strained to pull out a small wheel chair, sat it on the ground and opened it for use, locking the wheels in place with the safety brakes. He then walked around the van to the passenger side sliding door, opened it and disappeared up to his waist inside the vehicle for just a few moments. As he maneuvered his upper body back out of the doorway, attached to him was a small, frail looking boy, probably 8 or 9 years old who moved in jerky, floppy motion, like a marionette with the strings cut off. The man, who I assumed was the boy’s father, carried the child to the rear of the van, placed him in the wheelchair and strapped him in for better control. He then wiped the sweat from his brow and unlocked the safety brakes from the chair. The child’s arms and legs began to flail wildly, either in the excitement of the moment or from the cerebral palsy he was obviously afflicted with—or maybe both. I watched as the weary looking dad then shut the van doors and pushed the wheelchair carrying his son across the hot asphalt parking lot disappearing into the front entrance of the Mall. For obvious reasons, I am very sensitive to scenes like this. I am also very sensitive to the possibility that God sets me in certain strategic places and then opens my eyes to observe things that most people don’t get to see. I’m not sure what David Platt’s book has to do with what I observed, perhaps nothing—or maybe everything. Most of us feel something when we see the plights of an average family struggling with the challenges of raising a disabled child. Some of us feel pity, while others feel sympathy. Still others sense some kind of thankfulness as they place into perspective the smallness of the problems in their own lives. I also experience those thoughts, along with the empathy that comes from the bond of being a fellow parent with a disabled child. But more than that, I feel the strong desire to act. I want to offer assistance, give advice, share some encouragement, or pray for specific needs. Being in a police uniform and carrying a gun typically stops me from acting in any of those capacities unless prompted by dangerous circumstances or a divine appointment. It does happen, but usually in an obscure moment with little or no follow up. But as I sit on the parking lot today, I find myself in a different season of life than the father I just observed. My son is now grown and gone, being cared for by others in a way that I can no longer care for him. My life, once very radical, is now very comfortable. This is a good place to be—for a season. It is a very dangerous place to be—for a lifetime. I have enjoyed the rest and peace and shift in priorities in my life, but I don’t want to be lulled to sleep by them. Our family has never been a “normal” family. And now we have the chance to live this American dream to the fullest and do all the things “normal” families do. It’s tempting. At the same time, we also have an amazing opportunity to live radically once again, impacting the lives of many through the grace of God given to us in such a steady supply over these years. Raising Jake has been an adventure. It has also been an education—a training ground for ministry. God has spent this time equipping us for something great. I will not waste it on comfort and ease while so many around me continue to struggle in desperation and despair. I suppose this is where my blog and my life take a different turn, perhaps not so much “different” as “evolutionary” or even “revolutionary”. I hope that you, the reader, will continue to follow this adventure. There is a book coming soon, Lord willing, that will expand on the blog stories of raising Jake and the lessons of grace gleaned from his life. I desire that it will honor the gospel, glorify God and magnify Christ. I also pray that the book will serve to extend the message of hope and grace to the many hurting families struggling through disability, as well as those who are simply struggling with life and hopelessness. God’s grace is sufficient for all things, and in great weakness there is found great strength from a great Savior. This is the true message of the book, and this is the true hope for all our disabilities. The blog itself will begin to take on a new role as I attempt to tell the stories of grace in the lives of so many others who wrestle with angels of their own. God’s grace is all around us, waiting to be unveiled and marveled at in the celestial circumstances of life. At first these accounts may seem few and far in between since I have now obligated most of my free time to complete this book. But I will stay faithful to the prompting of the Lord and I will be observant to what He is doing in and through the lives around me. I anticipate my calling as a police officer will continue to serve as a window of opportunity to both see and record these adventures of grace. Thank you for your many comments of encouragement and hope, as well as your petitions and prayers. I don’t respond to all of them in writing, but I assure you that I respond to each of them with praise and thanksgiving to my Father. You will never know the incredible strength that is given to my family on a daily basis through these simple, yet profound words and prayers. Now follow me as I follow Christ on this untamed, radical journey of grace. There will be many divine appointments along the way. Pay close attention to the eternal beauty of what He is doing. There is so much more going on than you could ever imagine…and He’s inviting you to be a part of it all. The house is very quiet this evening. I can hear the stream across from our front porch flowing hard against its banks, draining the water from the surrounding hillsides saturated by the violence of yesterday’s storm. But the sky is clear tonight and the woods are alive with the sounds of late spring. There is a certain hope in the fragrance of the air. I have time to think about all that has happened over the past few years, months and days. Since Jake was born I have not had this kind of freedom to simply sit and contemplate without agenda or interruption. As we settle into our son’s absence, there are bitter-sweet blessings to behold. To lay in bed on a Saturday morning, to sit on the porch swing with my wife, to go fishing with my sons, have a tea party with my daughter, or go out to a restaurant with the entire family used to be a rare jewel of exceptional grace. Now it is strangely normal. I can see how the average family could eventually take these moments for granted. I hope we never do. But the sweet blessings of peace, tranquility and quality time also have a bitter side. Our family is incomplete. Our son and brother is missing. There is an empty chair at the dinner table. The house is very quiet—and I have time to think. Sometimes, in the stillness of it all, anxiety sneaks in and strangles my peace. "Where is my son? Who is caring for him tonight? Is he scared? Is he hungry? Does he feel abandoned or alone? Does he miss his family? Is there something he needs to tell us that only we can understand? What if someone abuses or neglects him…we would never know!" Pride leads to guilt; guilt leads to depression; depression leads to desperation. And desperation always finds me groping for God’s promises. It was in this desperation that I came across Matthew 18:10 and the words of Jesus tonight. 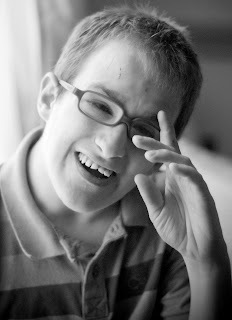 I do not believe Jake has a guardian angel assigned to his disability to protect him from harm. I do believe, however, that he has a guardian Father who sits on His throne in heaven surrounded by an army of angels intently watching the face of their Commander and Chief. And with one nod of the Almighty’s head, a legion of angels could be dispatched to preserve and protect my son. Night and day they wait and watch the Father’s face as His eyes watch over Jake. Our house has always been like a fortress, locked down with alarm systems and dead bolts keeping Jake from escaping into an outside world where danger lurks and disaster waits. But locks and alarms are a false sense of security from unpredictable circumstances and sovereign providence. When Jake was three years old he nearly drowned in a creek outside our home. The Father nodded and the angels were dispatched. My wife found him face down in the water, lips blue and skin cold. She administered CPR until he began breathing again. When Jake was five he wandered out into traffic on a busy street. The Father nodded and the angels were dispatched. The speeding car screeched to a halt just inches from my son. A couple years ago, when Jake escaped the house and wondered deep into our neighborhood at the vulnerability of traffic, strangers and vicious dogs—the Father nodded, the angels were dispatched and Jake was brought home. Only days after Jake moved to the center and school, another mentally disabled resident took a pillow and put in over Jakes face as he slept. The Father nodded, the angels were dispatched, and the care worker decided to check the rooms of the sleeping residents. He walked in as the other child was trying to smother Jake to death, “because he was being too loud.” The other child was removed from the building and Jake never even knew what happened. Will God always protect my son from danger and harm? No, because it is always dangerous to be His child. And sometimes pain, suffering and even death are ways that God is most glorified in our lives. But God will forever be present, care for and love my Jake with a Father’s compassion that outshines my best abilities and most hopeful intentions as an earthly father—a compassion that is always diligent, always attentive and always caring for his most intimate needs. And so as I sit and listen to the creek flowing hard against its banks tonight, I have time to think. It is a bitter-sweet time. I miss my son. But I am reminded that God is on His throne at this very moment. He has His eyes on my boy, and an army of angels have their eyes on the face of my Father. Jake is in good hands. A few nights ago, my white t-shirt was soaked with the tears of my wife. She buried her face in my chest and opened the floodgates of her heart as I held her in our bed. Seventeen years of glorious, painful struggle had come down to this night. “I feel like I have failed him…” she sobbed. “We have not failed. We have always sought what is best for him. This is best for him…this is best for everyone.” I replied, trying to convince myself in a parallel attempt to comfort my wife. 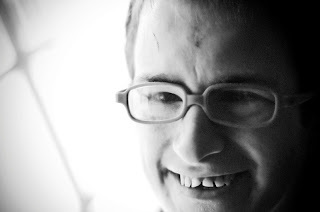 A few months ago Jake was enrolled in a special school to help him transition to more independent living in a special needs community as adulthood inevitably advances on his life. Much to our amazement, he thrived in this super structured environment. The original plan was to get him toilet trained, work on his behavior skills, and then transition him back home with respite assistance. He came home this past weekend for a visit and the original plan fell to pieces. A case worker from the school brought him to the house so we could celebrate his 17th birthday and within minutes of walking through our door Jake had regressed back to the state his original violent, miserable condition. The case worker stood aghast as Jake messed his pants, crawled on the floor and curled up into a fetal position in the corner of his room. It took three of us to change his clothes and get him cleaned up—two to hold him down and one to scrub and clean. “We’ve never known anything different,” my voice cracking in hope-strangled disappointment. Most of the visit went well; as well as one can expect with Jake. But the nervous pacing, incessant whining and repetitive compulsive behavior seemed to increase with each hour. As time approached for Jake to return to the school he became peaceful and calm again. He hugged his brothers and sister; then dad and mom. Before walking to the car he picked up his small computer talker that he wears around his neck and said, “Goodbye”. He waved like the grand marshal in a ticker tape parade and blew us volley of passionate kisses. I buckled him into the back seat of the care worker’s car. And just like that…he was gone. For a brief moment I felt like a normal parent watching his 17 year old son drive away to college. Then, in almost a panic, it seemed like someone had just kidnapped our baby boy. Like a good cop and faithful father, I wanted to run after the car, catch the kidnapper and rescue my son. Then I realized—this was the rescue. Jake was moving to the best quality of adult life that we could offer. My selfish attitude of, “No one can care for my son as good as myself” faded into the submission and surrender of his future to the care of my sovereign God. My wife and I sat on the front porch swing most of that day--wondering…grieving…resting. It was almost like a death in the family, except no one came with food and condolences. We were all alone. I told a friend it was like we had just completed a marathon together, but when we crossed the finish line no one was there to cheer us on. Then we realized the race had been over for quite some time. All the lights were off and the crowds had gone home. There was no celebration, just exhaustion, weariness and fatigue. We embraced each other at the finish line knowing we lost, but still grasping for the hope that at the very least, we finished the race. I really don’t know where to go from here. Perhaps this will be the final chapter in the book I now have time to write. Maybe I’ll get a hobby, go fishing, make some new friends and do whatever good friends do. Or better yet, I think I’ll take my wife on a date and not have to worry about getting a call from the neighbors that Jake escaped the house again and was found wondering the neighborhood. Maybe I’ll spend some quality time with my other three children who have been so patient and generous with their dad’s focus on Jake through the years. Whatever I do, it will be very different than what I have done for the past 17 years. On one hand this is good—I have a lot to catch up on. On the other hand this is nearly impossible—as Jake has shaped my very character and purpose throughout most of my adult life. Either way, I know this winter of our life is coming to an end. But at the same time a new season is blowing in like a spring thunderstorm. The storm will end soon, followed by milder weather, greener grass and lots of flowers. And perhaps now I will have time to walk with my wife, hold her hand, and smell them all.